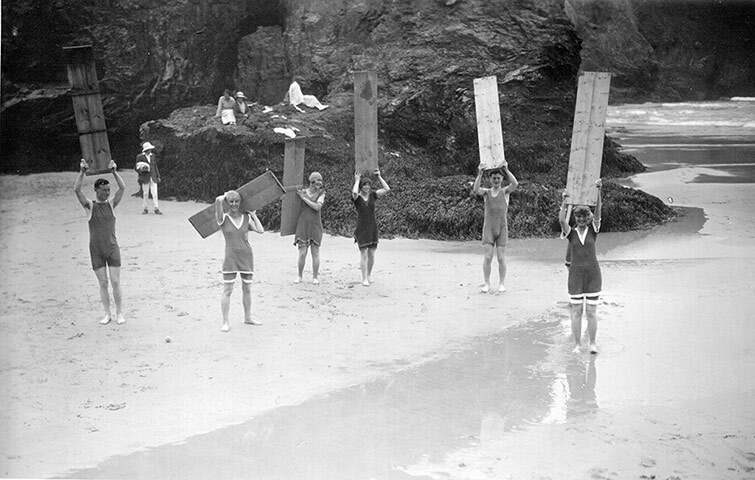 As you may have noticed in this month’s ‘What’s on’, this Sunday saw the World Belly Board Championships come to Chapel Porth beach in Cornwall. Although the contest has only been taking place for the last 12 years, it builds on a long heritage of Cornish (and national) surfing. According to the British Surfing Museum (who knew Britain had a Surfing Museum?! 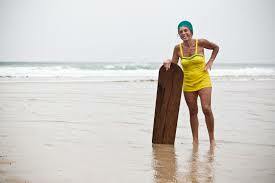 ), Surf riding – or bellyboarding as people have come to describe it – dates back at least a century in Britain. There is evidence of surfing in the UK in the very early 1900s, but it became a popular beach activity in Cornwall and Devon at the end of World War I. A mixture of wealthy Brits travelling to Hawaii & learning to surf, and soldiers chatting to Commonwealth surfers in the trenches combined to create something quintessentially British. Apparently, even Edward VIII (while still the Prince of Wales) had a try at surfing when visiting Hawaii. While more low key than the comparative American surf culture, British surf riding in the rolling Atlantic breakers became a must do activity for hundreds of men and women. 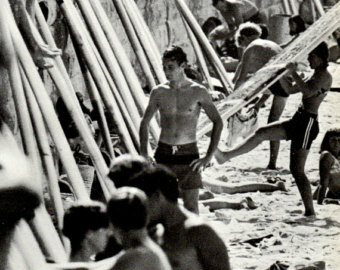 After the Second World War, bellyboarding resumed as Brits returned to the beaches in their droves, and many thousands of bellyboards were made in the 1950s and 60s to service the growing demand. 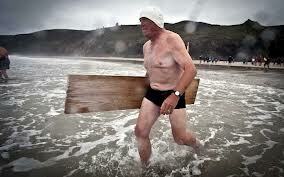 The standing up British surf scene has advanced in line with the global surf industry and Britain has produced notable surfers, but bellyboarding remains the same simple pleasure; and many of the early belly boarders have remained active surfers into their 80s – often with their original boards. 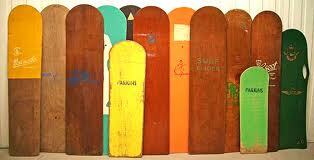 Many of these original boards appear at the Champs and are still ridden all across the country in the same exhilarating way. 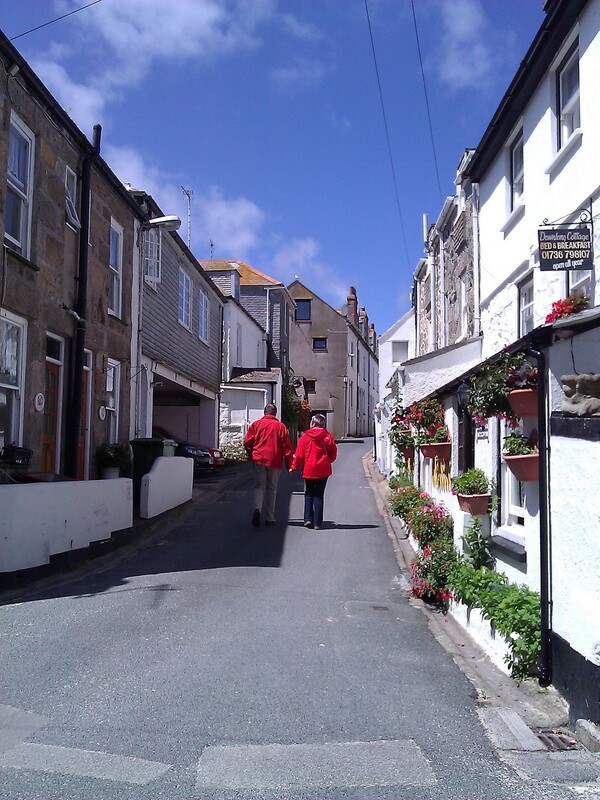 Redruth is not the first place you think of visiting if you visit Cornwall. It was once a hub of the Cornish mining industry, and is full of faded grand Victorian buildings, but since the decline of the mines a hundred years ago, it has suffered from a loss of direction and a lack of investment. But in the five years I have been visiting, it has been re-inventing itself and the low rents mean that among the high street regulars you can find a number of vintage and other individual shops. Who would guess this is the entrance to a vintage emporium? Down the alleyway, is a complex of buildings that used to form the bakery, and now make up the shop, stores and workshop. The family found the Old Steam Bakery over 20 years ago, and have kept the character of the building while building a thriving vintage business. This is the main room of the shop – chock full of goodies! Everywhere you look, there’s something of interest in this room! I loved the way they’ve used parasols to cover the ceiling. One of the two steam ovens visible in the shop. I liked this unusual compote dish, I’ve seen plenty of cabbage leaf plates, but never one with grapes and vine leaves. I love the baubles and had great fun spotting the ones we had on the family Christmas tree when I was growing up! I left with two coats and the intention to return soon, and I’d recommend it as a place to visit if you’re in the area. 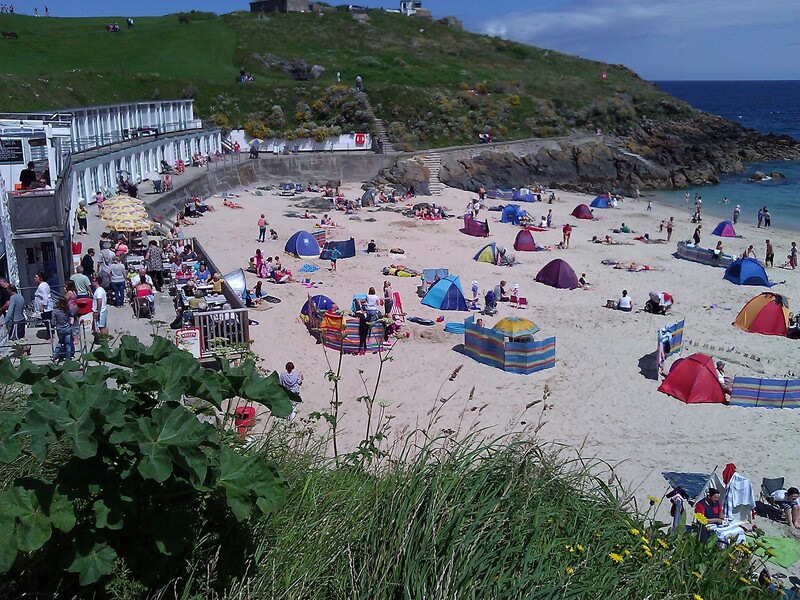 Yes, in a special, one day only, kind of deal, the sun has come out in Cornwall! When I moved down to Cornwall I had fond memories of holidays when the sun always shone, the beaches sparkled and the sea was crystal blue. Sadly, the reality has proved to be rather more grey and damp, with more rain and lower temperatures than the national average for the last four summers. I’m left wondering wether this is the effect of global warming, or just my lousy memory. That said, when the sun does come out down here we know how to make the most of it. 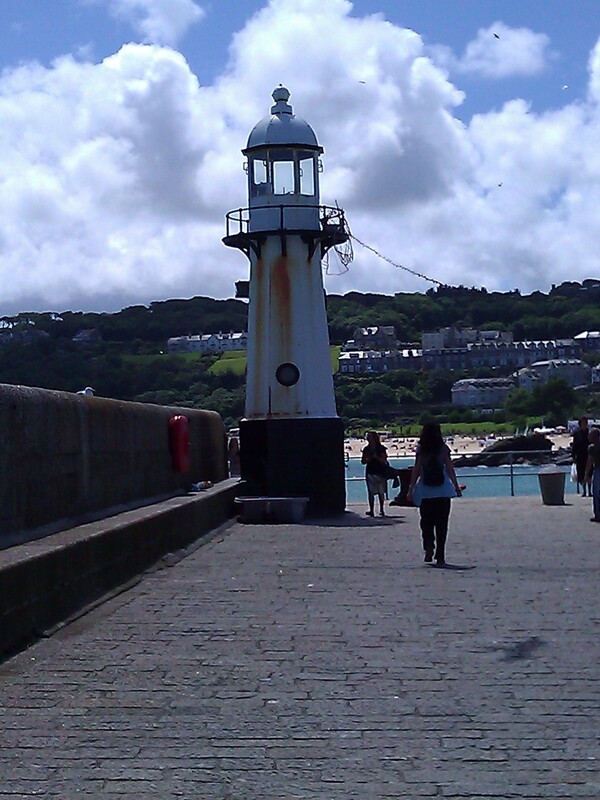 And so, with a sunny day promised, we abandoned all our plans and made for St Ives for our final visit before the school summer holidays. 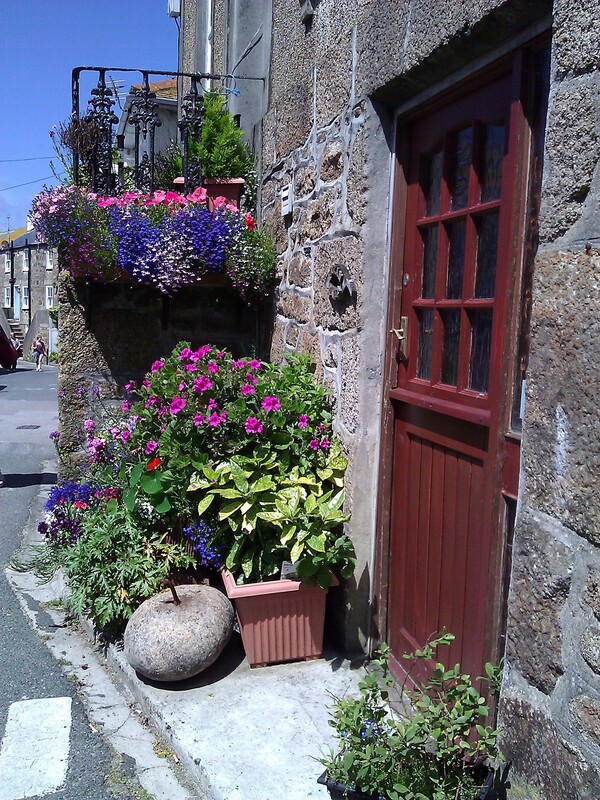 Walking through the back streets on our way to the beach, I was struck by this fantastic floral display. Although the houses don’t have much outside space, I love how much colour they have managed to cram in. The thing that looks like a curling iron at the bottom of the picture is made from granite and I dread to think how much it weighs. While I don’t know what it was originally used for, I would bet that it could anchor a boat in one place! It was 21 degrees, so I have no idea why the couple in this picture were still in their anoraks! 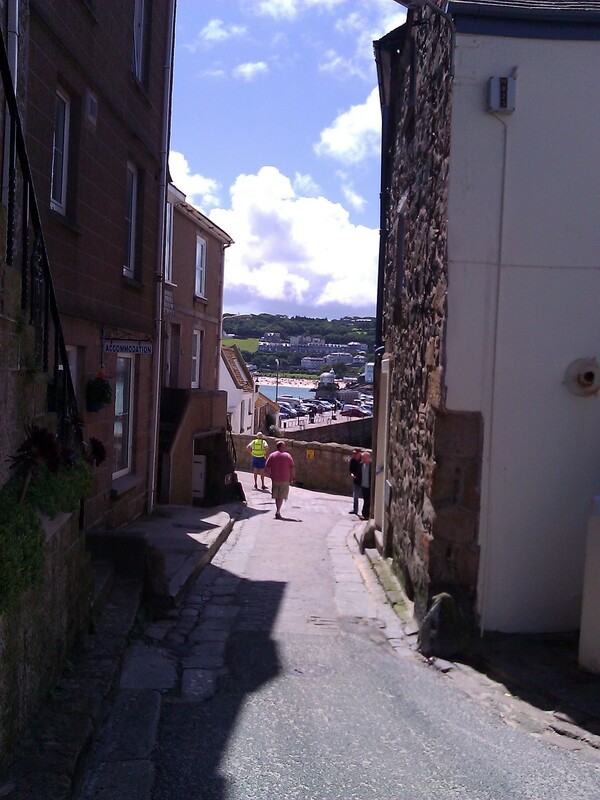 Looking down the hill towards the harbour. 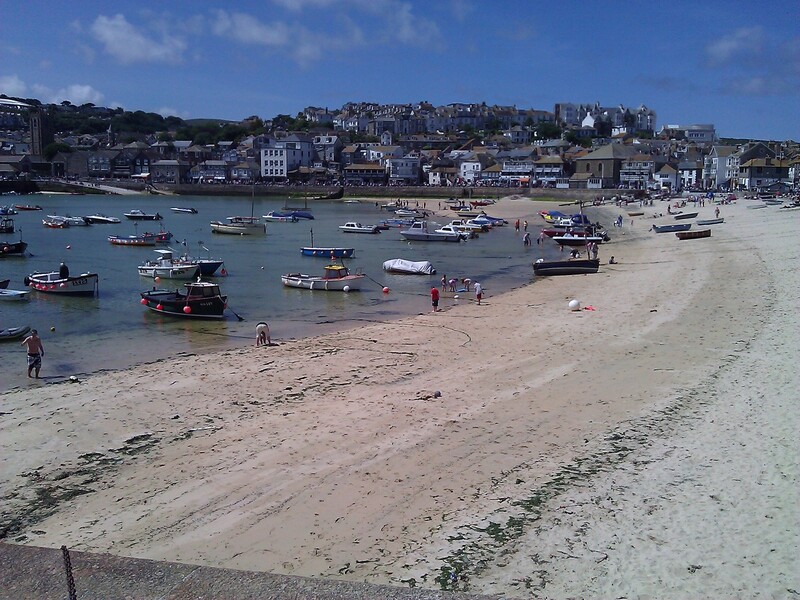 St Ives still has a working harbour, although there are many leisure boats and boat trips operating out of the harbour as well. 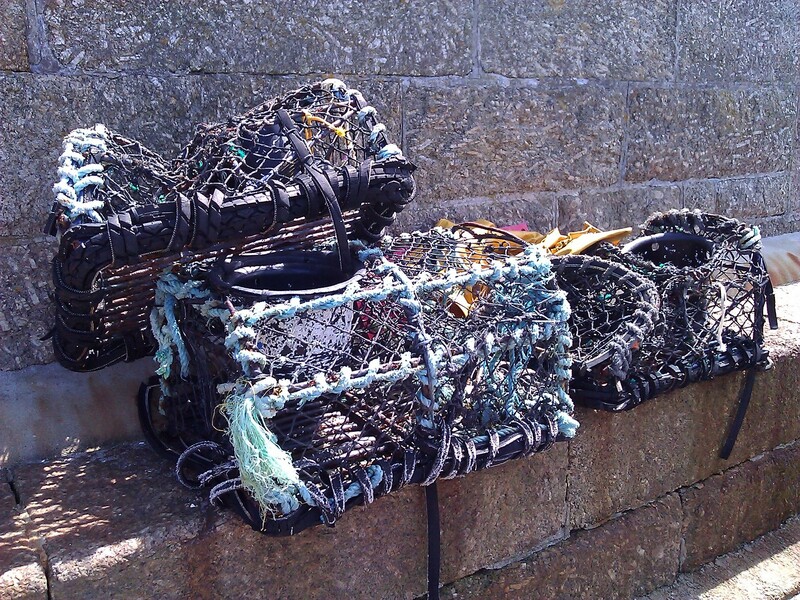 These were some of the lobster pots drying on the pier wall (in winter we often see huge groups of sparrows inside these pots, but haven’t been able to work out if this is for shelter or food). 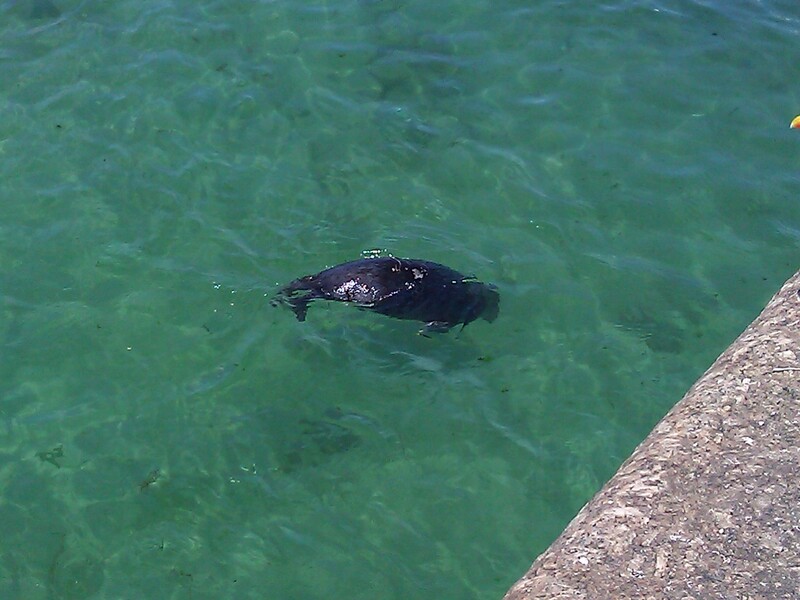 This wily seal was collecting dead fish from the bottom of the harbour where they had been discarded by the fishing boats. 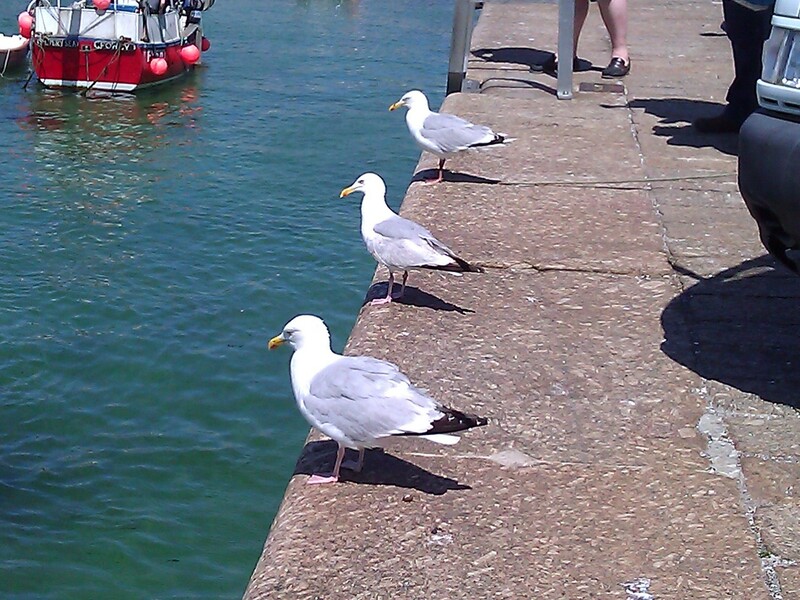 He’d then bring them up to the surface to eat them, at which point the seagulls would dive bomb him trying to get their share! Sorry I couldn’t get a better picture but I only had my mobile phone. Anyone would think it was summer! Sadly, today we’re back to work and back to grey skies and drizzle.